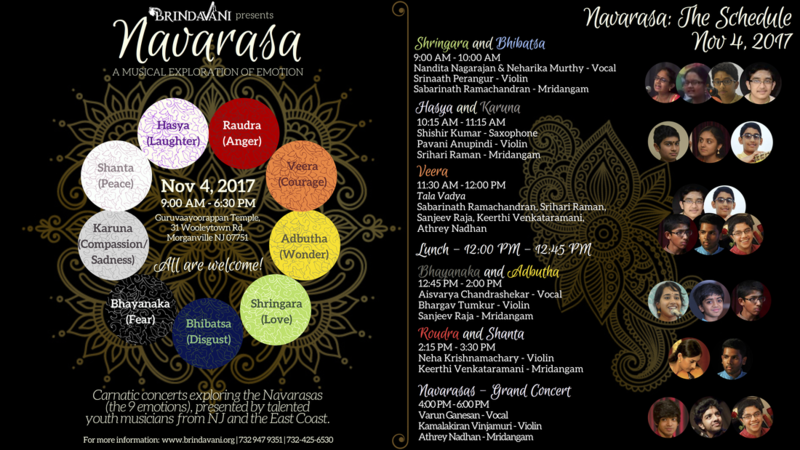 Brindavani is delighted to announce its 2017 fall event, ​Navarasa: The Festival of Emotion. The word "Navarasa" translates to 9 emotions. According to traditional Tantric and Ayurvedic beliefs, there exist 9 rasas, or emotions. These are Shringara (love), Hasya (laughter), Karuna (sadness), Raudra (anger), Veera (courage), Bhayanaka (fear), Bibhatsya (disgust), Adbutha (wonder), and Shantha (peace). Together, these emotions encapsulate the basic feelings of the human condition. Understanding the relationships between the 9 rasas is believed to cultivate greater awareness and control of one's emotions. This theme is typically explored through Bharathanatyam and dance, but our festival will be an innovative showcase of emotion through music, featuring top youth Carnatic musicians from throughout the East Coast. Each concert will highlight 1 or 2 contrasting rasas through thematic song and raga selections, culminating in a finale which highlights all 9 rasas. Please attend and enjoy this unique celebration of emotion through music. All are welcome!